While the typical residential refrigerator is more like an air conditioner since a mechanical compressor is utilized, the RV absorption refrigerator remains a mystery to many. It is probably the most perplexing of all the LP-burning appliances found in the typical RV today. Understanding the theory of absorption and “absorbing” why it takes heat in order to make cold can be mysterious even for the most engineer-like amongst us. The usual result is to simply shake our head and grab another cool beverage from the fridge. But by grasping a basic view of the theory of absorption and understanding the importance of leveling, ventilation, and cleanliness, the RV refrigerator can provide many years of RVing enjoyment and independence. 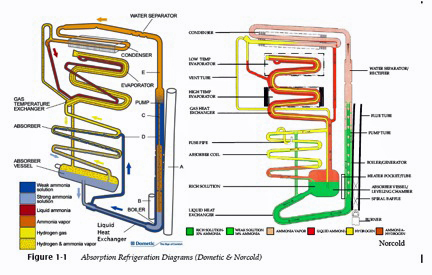 Let’s take a look at the absorption refrigerator by first examining the heart of the refrigerator, the cooling unit. A typical RV refrigerator cooling unit consists of four major components; the boiler, condenser, evaporators and absorber. The unit is sealed and pressurized and is non-field-repairable. The internal contents of the sealed absorption system include water, liquefied ammonia, hydrogen gas and sodium chromate, the chemical used to line the internal pipes to protect them from the corrosiveness of the ammonia. During a typical cycle, heat is applied to the boiler by either an electric heating element or an open LP flame. Water and liquid ammonia begin to boil and ammonia vapor is passed on to the condenser. The water is separated and returns to the boiler section. After condensing back into a liquid, hydrogen vapor is introduced to the liquid ammonia at the low temperature evaporator located in the freezer compartment. In short, heat from inside the freezer is transferred through the pipes of the low temperature evaporator and released to the exterior. Since the absence of heat is cold, the freezer and everything in it becomes cold. Next, a remnant of mixed hydrogen vapor and liquid ammonia passes to the high temperature evaporator located in the main food storage compartment and the process of removing the heat continues albeit, less assertively. The food storage compartment/high temperature evaporator becomes cold, but not as cold as the low temperature evaporator in the freezer. Upon leaving the evaporator sections, the weakened ammonia liquid then flows into the absorber coils. Here the hydrogen vapor rises back up to the evaporator section while the ammonia is mixed with water in the absorber vessel, flows to the boiler and the process starts all over again. From the point where liquid ammonia leaves the condenser until it reaches the absorber and re-mixes with the water, gravity provides the impetus. Off level operation slows the pace and causes overheating in the boiler section. Continued operation in an over-heated condition results in cooling unit blockage when the sodium chromate particles turn to crystal and block sections of internal piping in the boiler. Unfortunately, in RV absorption refrigeration, this process cannot be reversed. The only remedy for a blocked cooling unit is replacement. The lesson – take the time to properly level the RV as demanded by the principles of absorption refrigeration. The bottom line: keep it level, keep it ventilated, keep it clean. Your refrigerator and your wallet will thank you. But how do we do that, you ask? By applying basic preventive maintenance practices, that’s how. That term, “preventive maintenance,” is probably familiar to your already if you’ve owned an RV for more than fifteen minutes. I’ve said this before; the wisdom of the concept behind the phrase is often recognized long after the fact. Such is often the case regarding the absorption refrigerator. All too often RVers obtain their education the hard way – through trial and error, and mostly by error at that. 1. Burner assembly and orifice. Must be accessed, disassembled, cleaned and reassembled. 2. Flue and flue baffle. If yours is accessible, remove it and clean away the carbon deposits. A specifically designed flue brush may be necessary. 3. Ignitor assembly. Likewise, the spark probe, ground probe and flame sensor must be free from carbon deposits. 4. Cooling unit. The cooling unit is accessible through the exterior refrigerator side vent. Vacuum and clean all exposed components and tubing. Inspect and clean the condenser fins at the very top of the cooling unit. Remove any blockages. 5. Refrigerator receptacle. Check for proper polarity and voltage at the refrigerator receptacle located at the rear of the refrigerator. 6. Printed circuit board contacts. Clean and preserve the contact strip on the printed circuit board and all other electrical terminals. 7. Main LP regulator. Be sure it is adjusted to 11.0 inches of water column and that the RV is LP leak-free. 8. Storage/non-use. After the camping season ends, be sure to thoroughly clean the inside of the refrigerator completely. Remove all food and wash down all plastic components. Do not use an abrasive cleanser. Block the refrigerator doors open to allow free flow air to circulate inside. Congratulations! You have, at least, gained an insight into the importance of preventive maintenance, as well as completing RV Refrigeration 101. For the details of how to actually perform an absorption refrigerator clean and service, check out this article.